Hello whoever you are reading this. I wanted to take a few moments and document the building of my train layout. I have surfed the Internet, and looked over many other people’s layouts trying to figure out how to build one myself. I found a guy who was going “step-by-step” through building his layout along time ago, but I can’t find it now. I did discover Greg’s web site and found a lot of good information here. I posted a challenge I was having, and within a day got some good advice. So I guess I would enjoy taking this opportunity to replace “That Guy” I found before, and document the building of my “N” scale layout here. I feel I should give a little bit of my back-story so you’ll understand why I have some stuff already. I was fortunate enough to have a job that I could telecommute. My boss was getting irritated that I would not respond when he instant messaged me on the computer. So I started a train layout in my home office to keep me in the office during the down times. It wasn’t much, just some track tacked down to some fuzz board. I got 4 DCC locomotives, a few buildings, and some rolling stock. I tried to do some scenery but it didn’t turn out so well. Anyway… long story short I changed to a better paying job that required me to be in their office, tore down my office, and dismantled my layout. I had to clear out all the “Stuff” that piles up in the unused places of our homes. And try to figure out what I could put there. A few years back (before the walls were framed in our basement) I drew a layout I would like to someday build. The newly built walls could not go completely where I thought they would go, so some modifications will have to happen. I know I personally like a complete circle. I wanted an outside track (express track) that a train can go in a continuous loop and look good while I was loading and unloading cars on another track. 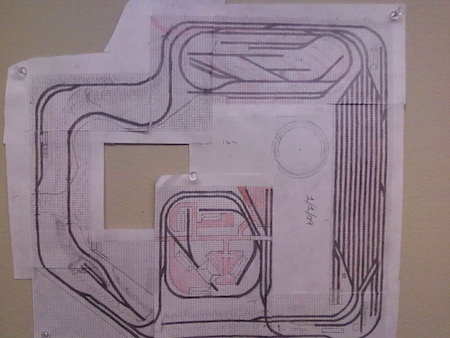 So this layout has an outer loop and an inner loop, they will connect at the staging yard. I also wanted my train to cross over a mountain that I could maybe cover in snow and make some kind of winter wonder land. So I researched how to make a “Grade” that would make my train go “up-and-over” something. It seemed that a 2% grade was the best. (Goes up or down 2 inches every 100 inches.) I decided to change that to 96inches because that’s 8 feet. The length of a sheet of plywood. I figured that 2 inches was not going to give me the separation I wanted between the inner track and the outer. So if I made the outer go “up” 2 inches and the inner loop go “down” 2 inches then I would get a 4 inch separation. That should do… I hope… we’ll find out. I went to some construction sites and begged for scraps of plywood and 2x4’s. I was able to get some good scraps of plywood but no 2x4’s over 3ft. long. 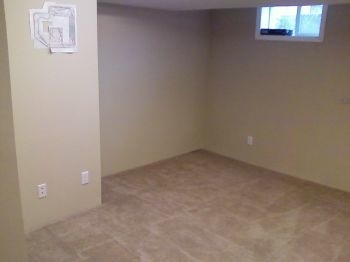 It was now that I realized that I will not live in this house forever, and may want to take this layout out of the basement. So I took the old drawing and divided it into sections. That way when I was done building it I could unbolt and take out. I found out that they call these sections “Modules”. I think that I can lay the track down and use a thin saw to cut the track so the train will go over the gap. 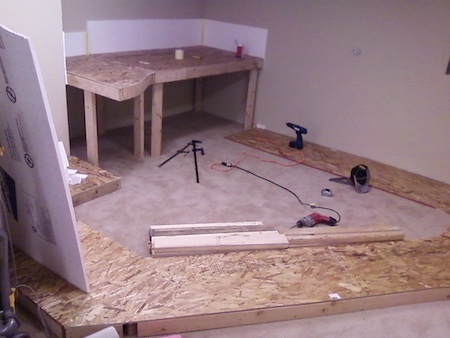 I started to measure the perimeter and cutting the plywood to fit. In a couple of places I put one piece on top of the other and drew lines where to cut them so I knew I would get a good fit later. I then took the sections of plywood to become “Modules” and took them outside to frame in the 2x4’s. I basically put a 2x4 on edge around the perimeter of the piece of plywood. 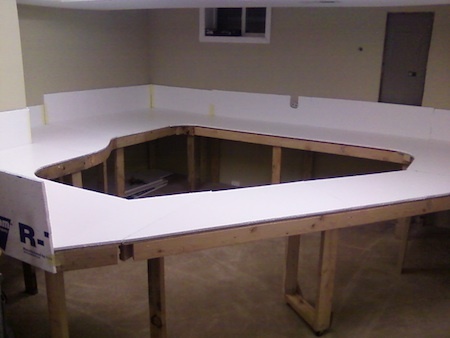 Anywhere I had more than 2 feet open gap I would put a 2x4 across the space… now to figure out how high I wanted the finished product to be. I liked the height of the kitchen counters, 36 inches off the floor. 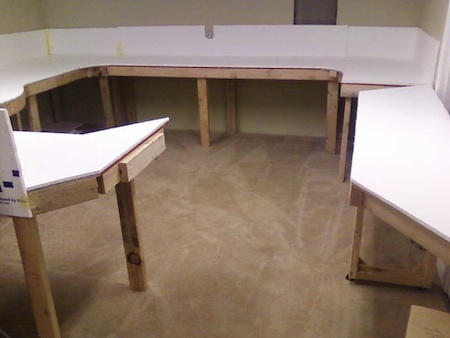 I figured I would have a ½ inch thick foam board, ½ inch plywood and 3 ½ inch wide 2x4. … Well crap! Here is where I figured I need space to put in landscaping detail. 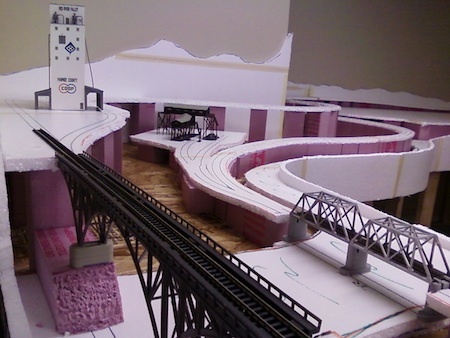 My track level will need to be well above the plywood. Back to the Internet I go… I discovered that most people put this 2 inch foam board on top of their plywood and the 2 to 4 inch foam risers on top of that… sheesh… money! I think I can make my own risers out of pieces of wood and glue the ½ in foam on top of that. We’ll see when I get there. I figured my track would be about 6 inches above the ply wood so I cut all my legs at 30 inches and started to attach them. I did consider that I will want some background, and needed to install something on the backside of the modules before they are attached to each other. I broke down and went to home depot and bought the ½ inch foam board. 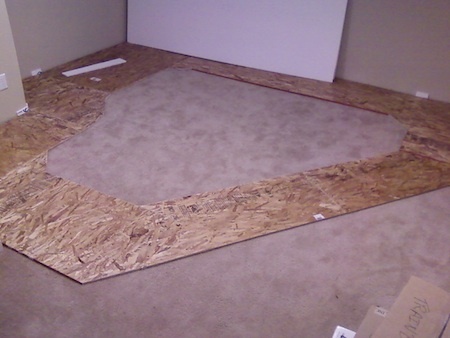 I laid the pieces over the plywood and traced it, cut it, and was ready for when it was time to mark the track. I took the scraps and cut them into 16 inch strips to glue to the back of the modules for my background. I used Elmers spray adhesive and it didn’t work so well. So I borrowed my father’s hot glue gun. Now that’s the way to go. I went through a lot and I mean a lot of glue sticks. Once I had all the pieces with legs under them I put the ½ inch foam board on top and was ready to put down some track so I can mark where it will go. From "Building My Empire" to "Showcase"
From "Building My Empire" to "HomePage"